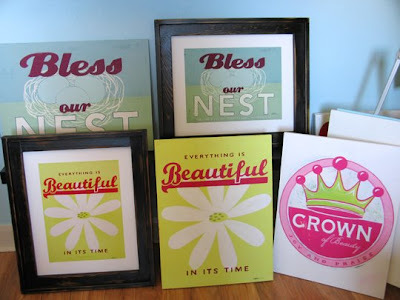 Inspiring Ideas with artist Jeanne Winters: 100th Post GIVEAWAY!! Yeah!!! I made it to 100 posts!! You regulars know I'm not a daily blogger, so it's taken awhile to get here! 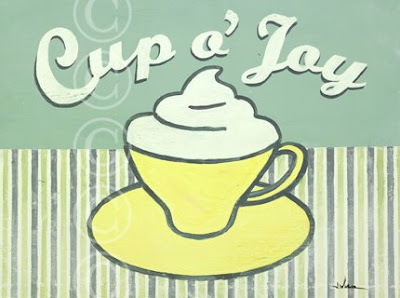 ... And... how do I celebrate every little occasion around here?? (b) subscribe by email or in a reader. AND, don't forget your email if you don't have a blog with a super visible email. Incidentally, if you are going to shop at DaySpring.com - which I highly recommend for great Christian products - please enter via my DaySpring button with my iron Icthus pictured over on the right. A portion will go to charity - more on that in an upcoming post. Thanks!! I wanna enter! Thanks for the chance. Oh, meant to add, I became a follower! My daughter giggling as I tucked her in bed and she said...You are the BEST mommy! That was the best moment this week I've had! I'll definitely add you to my list of blogs that I follow. As far as something nice that happened this past week, there were so many things. I'll go back to the most recent...we had a wonderful dinner last night with family at the house. That's about as good as it gets. Enter me as I follow your blog too! Great stuff! I love the ideas you share. Oops. Forgot to say what was good this past week. I had a family reunion this weekend. Got to see some cousins that I don't see very often. Good times at the farm! This week my house has stayed "in order," as the girls have played in their cardboard castle more than anything! Great week! Congrats on reaching 100! Something good...I spent quality time with my hubby! My birthday was this past week which is always great! Thanks for the chance to win! 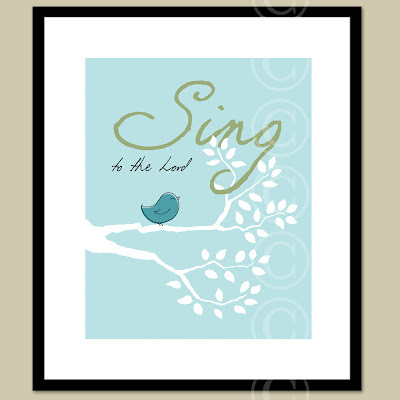 I love the birdie "sing to the Lord" print!! You have been in my google reader for quite awhile. Love your blog. something good: my toddler finally started sleeping through the night and my husband and I watched movies together and snuggled all week long! Oh, my! I always enjoy seeing your artwork. How fun it would be to actually own a piece! Something good this week - taking care of a friend's garden and having lots of yummy produce! This past weekend was wonderful, I got to celebrate my neice's 1st birthday, my son got his first tooth and learned how to clap! Fun Stuff! I hope I win I love the artwork! Well - I woke up everyday LOL. Enjoyed spending time with 3 of my grand children. Was able to get to church. I subscribed - thank you! Congratulations! Good thing this week...the sun came out for a few hours in New England. I am a follower, and have been. Love your creations. My in-laws had health scares this past week, but it all turned out OK...a big relief! BTW, great giveaway! You are already in my Reader, and I enjoy your blog. Congrats on 100 posts! I do follow ur blog and I love it!!! I love all of your things~ Happy 100th! I'd love to enter... something good that happened to me this past week was being healthy and having energy to have a fun adventure with my hubby! I love giveaways -- and this looks like a great one! One good things just today: My son finally arrived home from visiting his fiancee after having his flight delayed and then canceled due to bad weather. One good thing that happened to me was that I got to do yoga today! It makes me feel so good about myself and then I ate blueberry pancakes! Great day! Tonight I got to go on a walk with one of my girlfriends . . . an unexpected blessing! Hey, it's me again -- Shana from MN, from the last comment (unless someone snuck in between me and me). I already follow your adorable blog, so enter me again . . . please! Great giveaway, thanks! Let's see, something good that happened....I got to sleep in on Saturday morning with my pug curled up next to me! Congratulations on reaching 100 posts! Please enter me in the giveaway, you are so generous! Something good that happened to me this week: ohhhh the possibilities! It WASN'T being up from 2-5 with a teething baby, or rinsing out pooed in underwear, or prying fighting kids off of eachother for the billionth time since holidays started. BUT it could have been when my husband came home and cleaned the kitchen while I read a book... that was pretty fan-stinking-tabulous!!! Let's see, something good that happened this week-- being able to sit in our backyard in the evening and watch the kids play ball. I love summer! And I'm a blog follower. Love your stuff!! After being bitten by a rattlesnake on June 27 and going into antifilactic shock being here to enjoy another day is the best thing that has happened to me this past week! I am a follower and subscribe to your feed too so please enter me in this great giveaway!! Congratulation on 100 posts! K, so something good that happened to me this week. My almost 2 year old has MASTERED 3 VERY important life skills (well for OUR house hold anyway) So here are my exciting things... in sequence of importance. 2. She can drink from a "big girl" cup "all-by-a-self" (as she says).. with only spilling about an eighth of the contents on her lap. (she has twin 3 year old sisters, and HATES that she still has a sippy cup)lol. 3. She has CONQUERED the McDonald's PLAY PLACE slide!!!! WOOT WOOT! I can now SIT and enjoy the left over stale fries and cold nuggets, without having to wedge myself up into that awful contraption to rescue my baby! THIS has been an FANTASTIC week! I'm only sad that our Daddy has had to miss out. He is currently working hard in another state, while I sell our home here in Utah. :( ... So I would LOVE some new fun, inspiring art for our new home, that we will eventually be moving into. PS. Love your work, truly amazing colors and creativity! something good that happened to me this past week: I FINALLY painted the hallway after living here for 3 years! It feels so good and one of your pieces would look great in there! And oh yeah - I have been following you on my reader for a few months. Thanks! I like your kind of celebrating, too! Something good that happened to me this week was having my family here to help pack up our rental to move into our new house! The good thing happens to me everyday. When my soon to be 3yo sees me there to pick him up from daycare, he runs & throws himself against my legs, big smile on his face as he screams "Moooooommmmmeeeee!" I have also been a follower for some time now. Love your blog! Such eye candy. Something good that happened this week is that I made a fun fireplace screen out of two old shutters and I love it! I have been a follower for some time now. Your blog is so lovely! Yesterday morning I was feeling quite drained from a busy weekend, but when my little grandson arrived at 6:30am, his precious smile just energized me! This is how I am blessed to start each morning! It's great to be back here. I am certainly one of your biggest fans. I have been subscribed to DaySpring for quite some time now and when I saw your art being sold there, if I'm not mistaken that was last week, I was surprised. I'm quite happy that I am your friend. I'm like, "Oh my most creative friend!" I have been meaning to email you when I got that email but got so busy. BTW, one question, do you know how to make freeze dried rose petals? I hope to win! hehehe! This would be a wonderful gift for my fiance on our 15th monthsary on the 25th. Whoever wins, that person deserves it! I just totally admire you. Really. You are one of the most creative persons I know. iLoveYouSoMuch, my darling co-heiress in CHRIST! Congrats on #100!! I got to harvest my first home-grown veggies this week- very exiting after being apartment dwellers for so long to finally have the yard space to have a garden! Awesome and congratulations! My husband filled up the soap dispenser and took out the trash without me even asking him to! Cleaning out clutter and actually seeing the floor in a room that has been hidden under boxes from my daughter's wedding that was in May. And having my youngest son, 7, give a documentary on film of how he loves his new room and bed. Priceless. This past Friday my two little ones and I had a Fabulous Fun Friday! Our motto was "if it's not fun, we aren't doing it". I am already a follower. One good thing that happened is that my girls have finally taken an interest in a sport! We've done swim team, but last night they both got the spark. I'm happy they'll continue with this good form of exercise and that they will be safe in the water! We got to visit with my mom! Something good this week is warm weather that's not HOT. And little boy hugs. And blooming flowers. And my husband making dinner to give me a break...too many good things to list! AND I follow you in blogger! Always happy to see a new post to spark my creativity. My best moment this week is taking my first quilting class and this week is my birthday! Congratulations on your 100th post and thanks for a chance at a great give-away. My friends threw my a surprise baby shower! I had no idea and I was very touched by their thoughtfulness! Oh and I'm a subscriber! Congrats on the 100th post! something nice this week...well, tomorrow my husband starts a new job! Congrats!! I just wrote my 100th post last week!!! Woohoo!! That "I am the Vine..." is gorgeous! That is the scripture that our women's ministry at church is based on. Best thing that happened??? Nothing good.Ok the dr did say my son's finger looked good. I subscribe through a reader! Love your art! The best things that happened to me, are my everyday things, sunshine, a little rain, flowers in the garden, the wagging tails of my pups, my hubby's smile . . . wonderful and blessed. This week has been off to a fabulous start. my husband accepted a job offer. He is a professor and found out this May that his contract would not be renewed...he has been interviewing and prospects seemed slim...but an opportunity opened and we'll eb moving to OHIO---in three weeks. Wow! I'm a follower! and love all your beautiful things! I hope to win one of them! Thanks for the chance! We had an absolutely wonderful thing happen yesterday. My cousin had a beautiful 7lb 3oz baby girl!!! Her name is Lila and they are both doing great! I don't see the Google friends connect anywhere. Please tell me where to follow. Thanks! Congratulations on reaching 100 posts. I would love to own a copy of your book. My something good is that I caught up on my Bible study homework. At first thought people may think what happen to me was bad (I had a water pipe burst and flood a large portion of my house) but I am looking at it as good because it was God jump starting me to get rid of some of my clutter. I am going through everything that was not destoried and either throwing it away, yard sale or give away. Thanks for the opportunity to entry. I also signed up for the emails. I have been checking you site a couple times a week since before Christmas. My tomatoes started to ripen! Yay. Love your blog. So many good things have happened, but the one that sticks out is when they pumped too much gas into my gas tank. I got a full tank of gas (in a minivan no less!) for $10!!! Oh, enter me, please! Something good that happened to me this past week was that I got to spend 2 days in the Smoky Mountains with my husband and kids. I subscribe to your blog in my reader, too! Congratulations on 100 posts!!! I have enjoyed many of them. I have been a follower. I have just subscribed by email. This week has been full of the most pleasant days and I have spent as many hours as possible outside. Heat and humidity tomorrow but we have had gorgeous days for most of July. 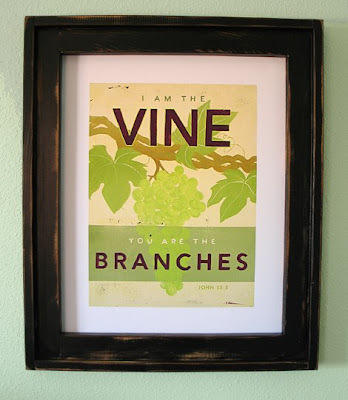 I have been wanting to get the "sing to the Lord" print for my son's nursery. Might as well try to win it! My best moment this week: I was at the dentist with a terrible pain. (I´m so frightened for dentists!). While waiting I read a book from Max Lucado ("Cappucino met Max" is the Dutch title). He wrote about how big the universe is. The God who made this universe is with you, he wrote, pointing to the bibleverse "I can do all things through Him who gives me strenght". I survived dentist and left happily (and without pain). Thank God for a little encouragement on the right time! Good thing this week...having a surprise, encouraging, laughter filled lunch with a good friend! I've realized that God blesses those times we choose to be unselfish with our time. Awesome prizes! My family & I just returned from a much-needed getaway last week. We spent a lot of time just being together & we all feel so much more refreshed! I love the birdie "sing to the Lord" also love your ideas. I live in Idaho, and I'm from Brasil, SPaulo. I was blessed to spend the day with my daughter and two grandchildren, running errands, buying groceries and just being together! I have had my eye on that bird print...good luck to all! I have been loving everyone's fun "good things" stories!! So neat to see that some are really BIG things and some are just everyday sweetness! We were blessed to visit the Creation Museum for a couple days this week. Wonderful! My almost-5-year-old son completed his first swim lessons this week! 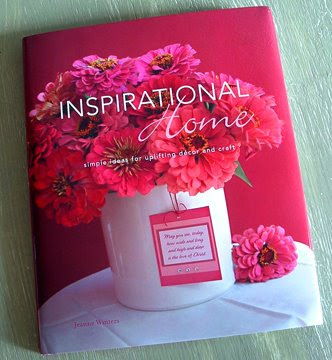 I enjoy your blog and would love to win your book. Thanks. Wow! Awesome stuff! Keeping my fingers crossed! I'm a subscriber....and the best thing that happened was I won a prize from the Chevron giveaway (a GPS sustem) and it came yesterday! Whoo-hoo! Congrats on your 100th post. 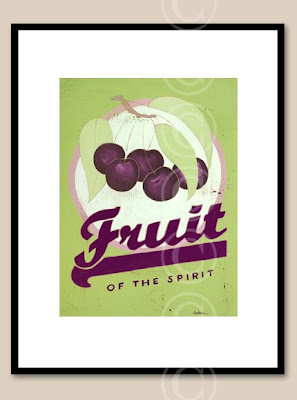 Love the print from your Etsy shop. This week I had dinner with my family because my younger brother was in town. It was a wonderful dinner with everyone together. Love your blog. I'm also a subscriber. Something good that happened to me this past week: my son saying "I love you too."